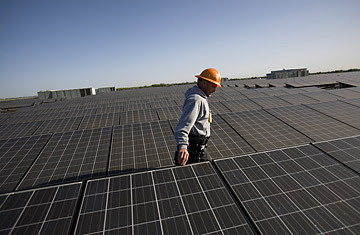 A solar technician employed by SunEdison checks the rooftop array of solar panels in Woodland, California. As House Democrats unveiled the details of their planned $825 billion stimulus package on Thursday, renewable energy advocates were watching closely. On the campaign trail, President-elect Barack Obama had promised to boost spending on alternative power and energy efficiency, not only to combat climate change but also to promote "green jobs"  like solar panel manufacture and weatherizing of buildings. With spiking unemployment, green jobs would have to be the solution for saving the Earth  and the economy. The tax credits couldn't come at a better time, but the question is, are they enough? Even as the environmental community prepares to celebrate the inauguration of perhaps the first truly green President, the renewable energy industry  especially young solar manufacturers  is struggling to survive. The recession has already claimed victims: Three Western solar manufacturers, OptiSolar, HelioVolt and SunEdison, are reportedly cutting jobs in the face of declining demand. Where there was a glut of orders for new solar systems as recently as the past summer, prices for rooftop solar arrays have dropped 8% to 10% since October, and are likely to keep falling this year. Layoffs are happening even in the more mature wind industry  including big companies like the Spanish firm Gamesa, which let go of staff in one of its Pennsylvania factories. The bad economy is clearly the main culprit  with houses and jobs at risk, fewer consumers are willing to make a long-term bet on a solar system  but so have ebbing subsidies for solar in Europe, where manufacturers in the U.S. still send most of their product abroad. Without Spain and Germany  leaders in European solar  soaking up systems, the research firm New Energy Finance estimates an oversupply in the industry of nearly 4 gigawatts in 2009. "There's real concern about the policy risks in Europe," says Christopher O'Brien, the head of North American market development for Oerlikon Solar. That leaves the U.S. market to make up the difference, and with Obama's election, many renewable energy advocates were confident the country was about to make a solar leap. But the credit market's deep freeze has hit new solar projects just as it has almost every other facet of the economy  the only difference is that many solar manufacturers don't have the cash reserves to ride out a long downturn. That could leave the U.S. shorthanded on solar at the very time when it's finally gotten serious about renewables. "This is still a capital intensive business," says Harris. "Either you have the money and the project will happen, or it won't." One way to get the money: the expanded tax credits for renewables in Obama's stimulus plan. The problem is that credits reduce a company's tax bills, but many renewable energy companies are start-ups that have yet to become profitable  meaning they don't pay enough taxes to benefit from a credit. Until recently, banks like Lehman Brothers bought credits from renewable energy companies and used them to reduce their own tax liabilities  for the good that did. With that market vaporized, Washington can increase tax credits all it wants, but the policy will have little effect. The answer is to make the tax credits directly refundable, so that if a solar start-up can use its credits to reduce its tax bill to below zero, it would actually receive a check from the government for the difference. "That would solve the problem, and we could go right to work," says O'Brien. So far, Obama's stimulus package does not include refundable credits, though they could be included in later legislation. O'Brien, who works on government relations and is based in Washington, says some in Congress worry that making the credits refundable would set an uncomfortable precedent. But if the government truly wants to change the energy sector  and make green jobs more than just green rhetoric  refundability is the way to make sure the solar industry doesn't go dark. See new ideas about renewable energy.